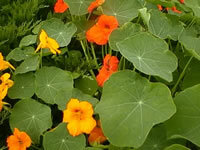 Once established, Nasturtium plants take little or no care. brightly colored, fragrant, edible 2" blossoms. There are two main forms of Nasturtiums. The dwarf varieties will grow to 15" tall as they form nice compact clumps. Climbing varieties grow up to eight feet as they spread along the ground, but are also capable of climbing up six foot fences, stumps or other structures. Nasturtiums are only hardy in USDA zones 8-11, so they are most commonly grown as annual plants. They will flower best if they are planted 6"-12" apart and grown in full sun, but are they also capable of growing in light shade. but they prefer sandy, not-too-rich soil mixes. Water regularly and thoroughly until new plants are well established, after which time Nasturtiums are very drought tolerant. Nasturtium plants tend to produce lots of lush foliage and no flowers when they are grown in rich soil, so fertilizing is seldom needed unless they are growing in extremely poor soil. Nasturtiums are very easily grown from seed, but they resent transplanting, so it is best to sow the seeds directly in the garden as soon as all danger of frost has passed. If you intend to start your seeds indoors, plant them in 'Jiffy Pots' which can be moved into the garden without disturbing the roots. Maintain a temperature of 65° in the medium for germination in 7-12 days. so be sure to cover them well! Nasturtium plants can also be propagated with basil cuttings, but this method tends to take longer than starting new plants from seed.